Make sure your truck is in compliance. We offer complete multi-point mechanical and safety inspections. 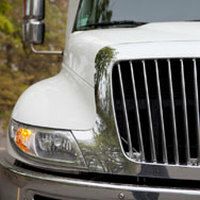 Commercial Trucks, Tractor Trailers, Large Dump Trucks and Buses. Commercial Inspection, Non-Commercial Inspections, 7D Inspections, Bus Inspections, RV Inspection. Per the Massachusetts state website - All commercial vehicles, trailers and converter dollies are subject to the Massachusetts Commercial Motor Vehicle Inspection. The Federal Motor Carrier Safety Administration (FMCSA) approved the Massachusetts Commercial Vehicle Inspection as equivalent to the annual FMCSA or “DOT” inspection. If your commercial vehicle/trailer receives a state safety inspection, you are not required to obtain a separate FMCSA or “DOT” inspection. 7D Semi-Annual Inspections: In addition to the annual state inspection, 7D vehicles are required to have a semi-annual safety inspection in accordance with M.G.L. c.90, s. 7A. These additional inspections take place in February-March and again in October-November. Not all state inspection facilities conduct 7D inspections, so you may need to locate a station other than your normal state inspection facility. Massachusetts registered single, full, or semi-trailers used in commerce, that have a gross vehicle weight rating (GVWR) over 3,000 pounds or commercial vehicle/trailer combinations with a gross combined weight rating (GCVWR) of over 10,000 pounds are subject to this requirement, as are all heavy duty motor vehicles (over 10,000 pounds GVWR) and converter dollies. RMV has created a one-page poster to help illustrate these commercial testing requirements. View Poster. Trailers and converter dollies in use after January 1, 2009 must be in compliance with this new inspection. For more information, please visit http://www.massdot.state.ma.us/rmv/inspect/commercial_regs.pdf. For more information about Commercial Vehicle Inspections, click here.